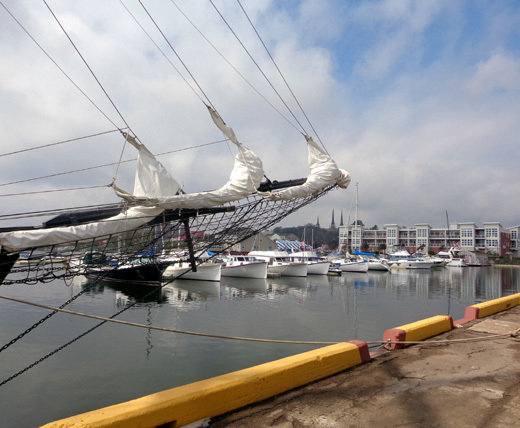 the city still evokes the feeling of a colonial seaport." 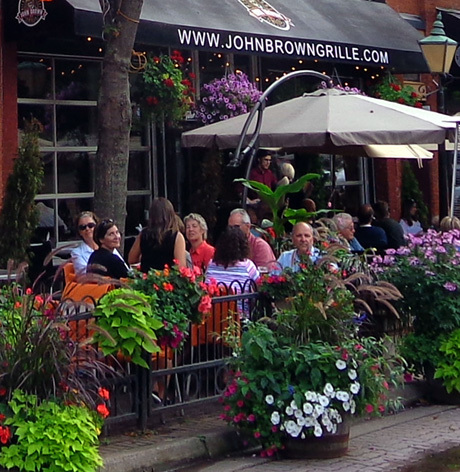 The charming city of Charlottetown, population ~ 35,000 people, is about as centrally located as you can get on Prince Edward Island. It's by far the largest urban area on the island -- but small enough for visitors to find their way around quite easily with a good map. 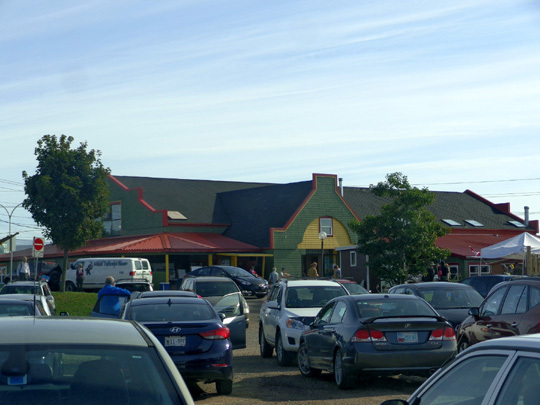 We chose our campground because of its proximity to both Charlottetown and the North Shore, about a 10-minute drive from each. That way we could easily enjoy not only the coastal scenery, small fishing villages, and nearby cycling-hiking trails, but also all the history, culture, architecture, harbor, attractions, restaurants, and other amenities of the city. 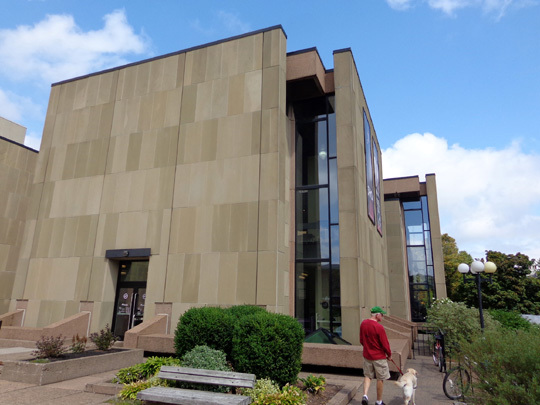 The photos and information in this entry are from three visits we made to Charlottetown. As noted above, we inadvertently arrived during an important time in the city's history. 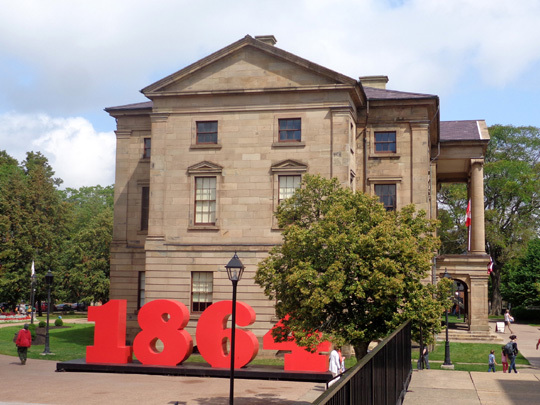 That's great, because we had even more of an opportunity to learn about the Charlottetown Conference and participate in some of the 150 special activities, festivals, and other events commemorating the anniversary. 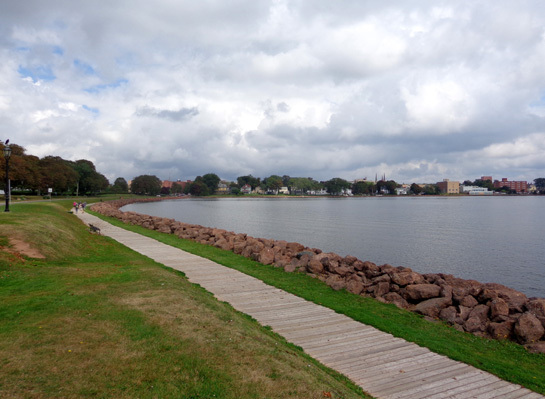 Like Halifax, Nova Scotia, old town Charlottetown, PEI lies on a peninsula surrounded on three sides by water. 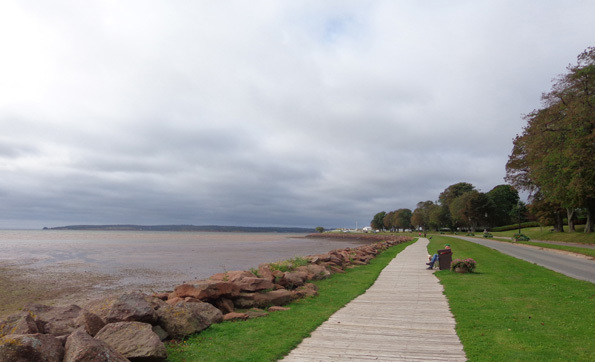 Here it's the Hillsborough River and Bay, part of Northumberland Strait. 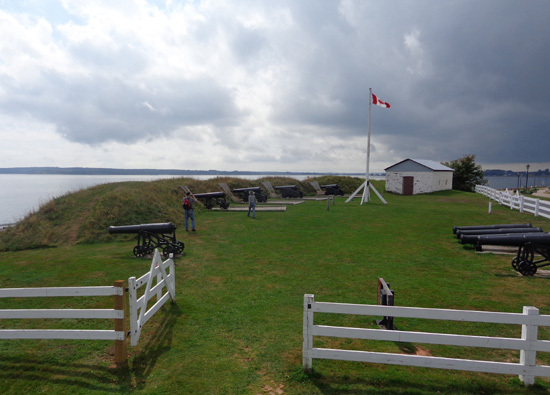 The city faces mainland Nova Scotia on the south side of PEI. 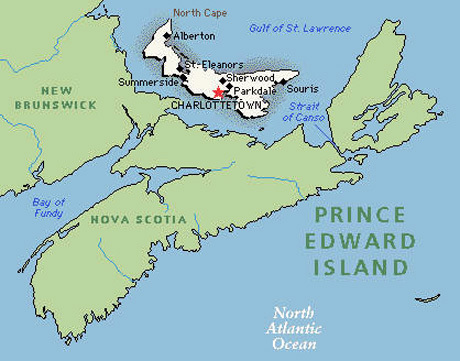 The Atlantic coast (more specifically, the Gulf of St. Lawrence) is a short drive north of the city. 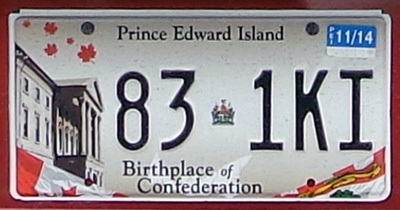 PEI is white and Charlottetown is marked with a red star. 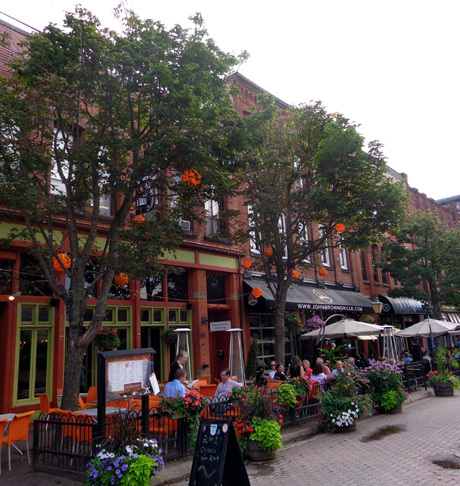 Charlottetown has less than one-tenth the population as Halifax. Its harbor isn't as grand but it is still scenic and has lots of water views from the older parts of town that were settled first. 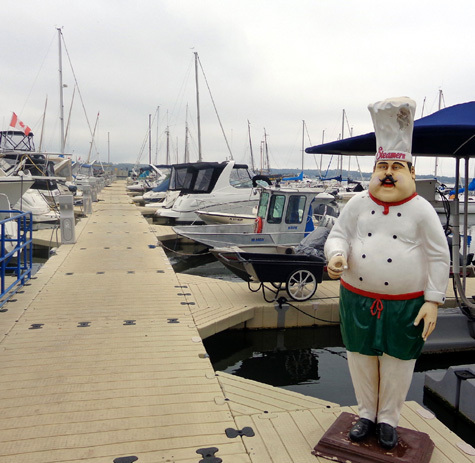 On Thursday we went down to the harbor area and enjoyed walking around. of the emphasis this year on the Confederacy's 150th anniversary. Note the kids below. 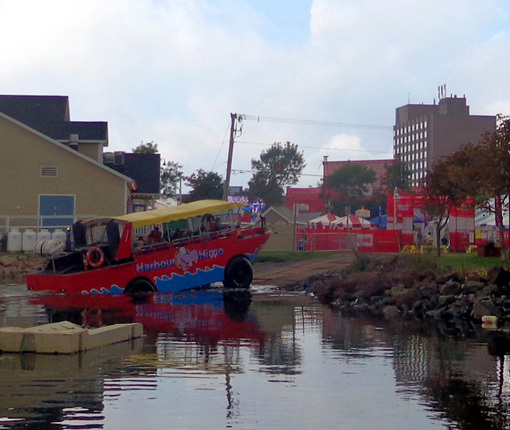 or just ride the "HippopotaBus" on land if you prefer. 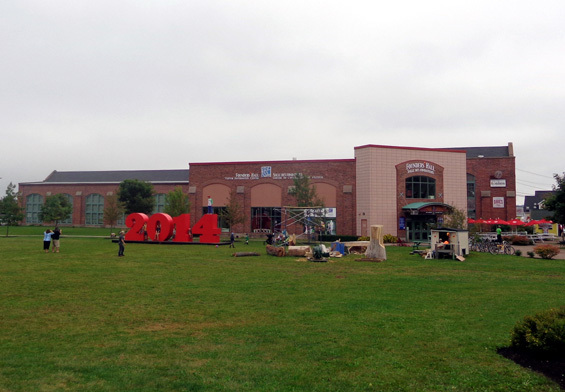 Part of the large "Celebration Zone" is shown in the background of the photo above. 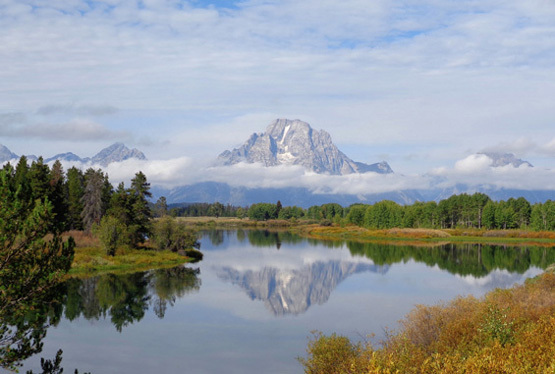 Daily concerts, cultural exhibits, local foods, kids' activities, and other events are scheduled there all summer long as part of the 150th anniversary celebration. 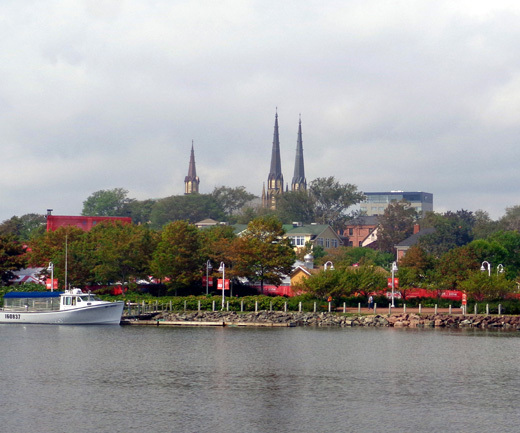 note the three tall spires of St. Dunstan's Basilica in the background (more about it later). 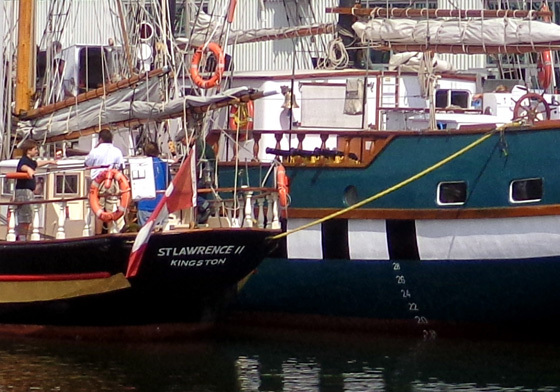 one is the "St. Lawrence II" and the larger one is the "Fair Jeanne." 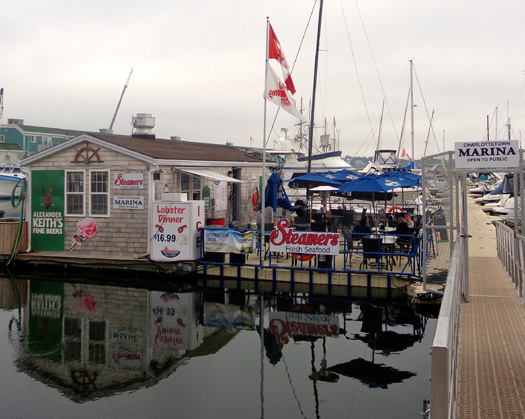 It was fun but we had better seafood at other restaurants and seafood shops in the Maritimes. 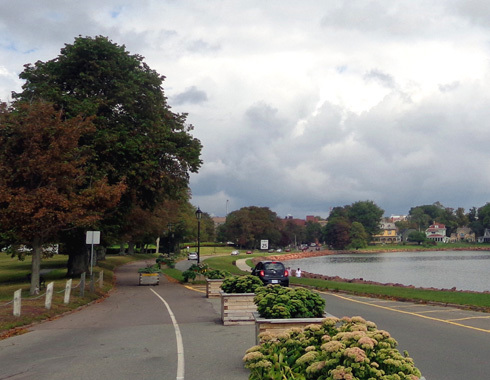 Also on Thursday we drove to nearby Victoria Park, which lies along the tip of the harbor. That day the tide was high. 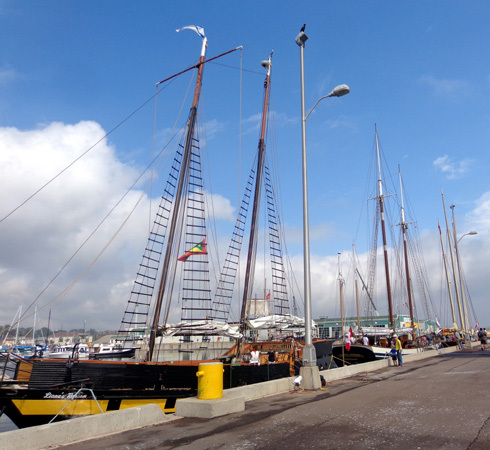 We went back on Sunday morning when the tall ships were scheduled to leave for Summerside, another town on the island a little west of Charlottetown. 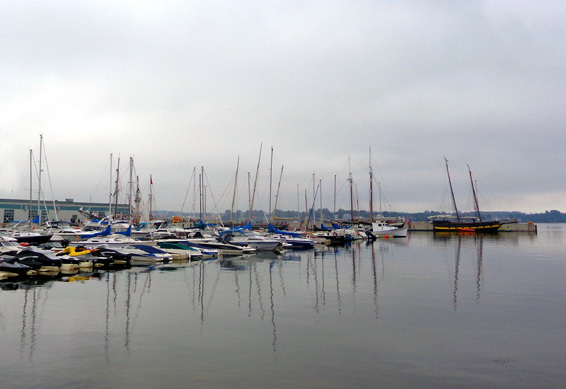 We wanted to see them sail out of the harbor and into the larger part of Hillsborough Bay. That day could best be described as overcast and blustery along the waterfront, too uncomfortable for us to sit on one of the benches to watch the tall ships go out of the harbor. We parked with some other vehicles at an overlook in the park and waited inside the truck for the ships. And waited. And waited. We finally heard on the radio that because of the wind, the ships weren't going to leave until about 6 PM. We considered going back to see them but didn't. 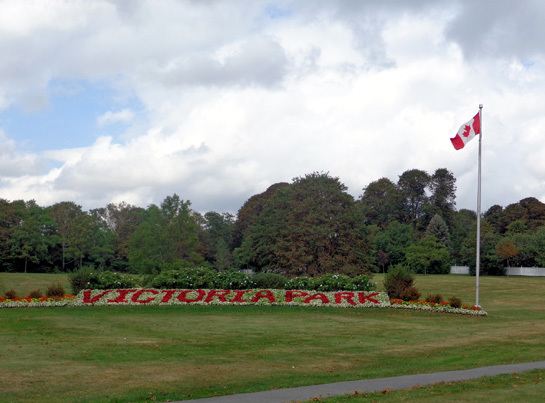 On Thursday as we left Victoria Park we passed the nearby Government House, where the Lt. Governor lives, and noted a group of 25-30 well-dressed people standing outside in a group. Turns out, it was a meeting of the provincial and territorial premiers -- like our governors in the States. We saw reports about it on TV that night. 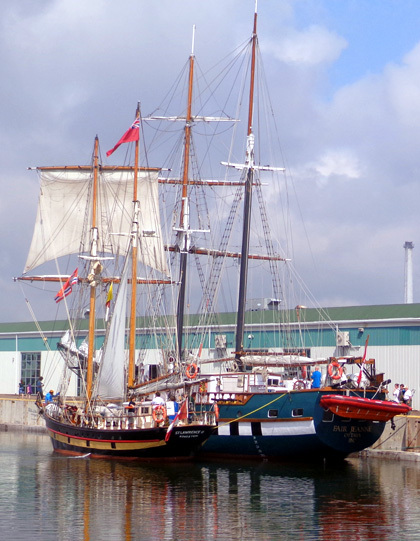 It was another ceremony commemorating the 150th anniversary of the Confederation. 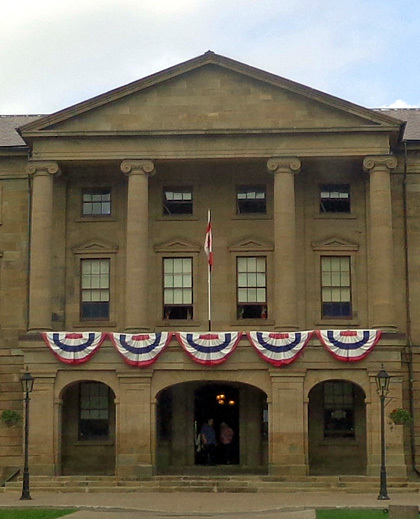 With all this talk about the 150th anniversary of the Confederation we figured we better see where the Charlottetown Conference was actually held, Province House. 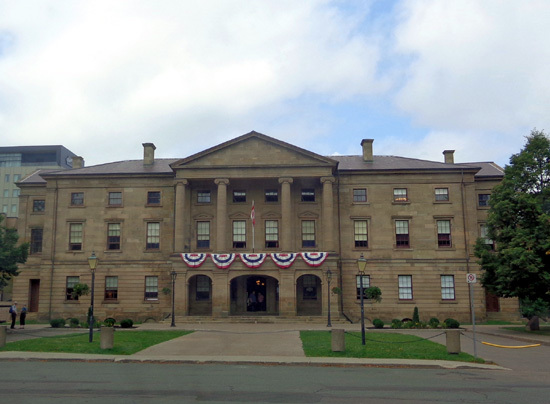 The stately Greek Revival building was completed in 1847. 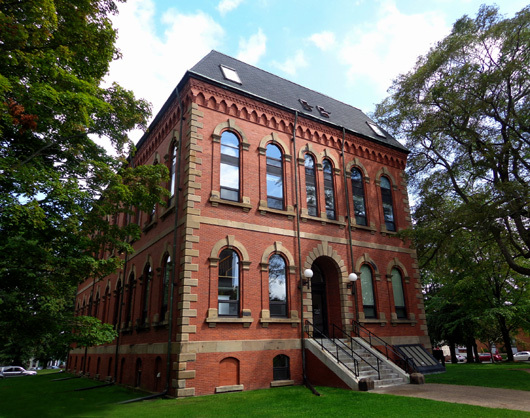 On the other side of Province House is the much newer, modernistic Confederation Center of the Arts. 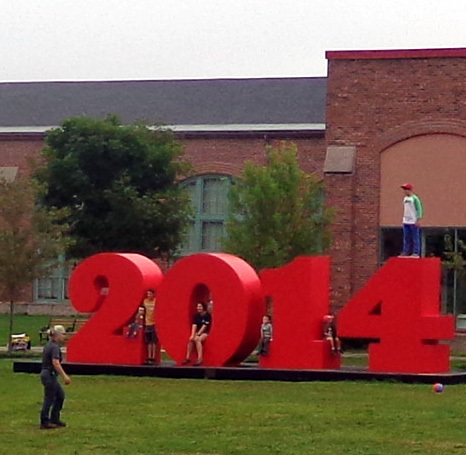 Jim and Casey walk through a terraced plaza around the museum. 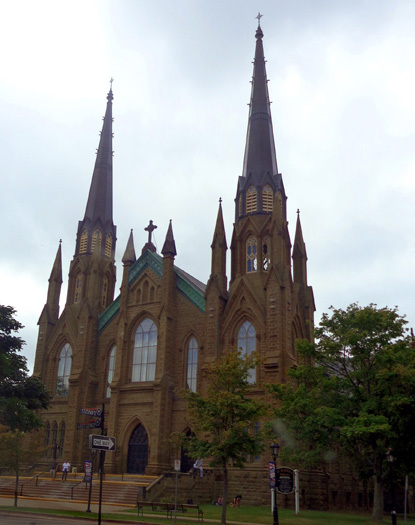 You can tour the church, which is built in the form of a Gothic cross. 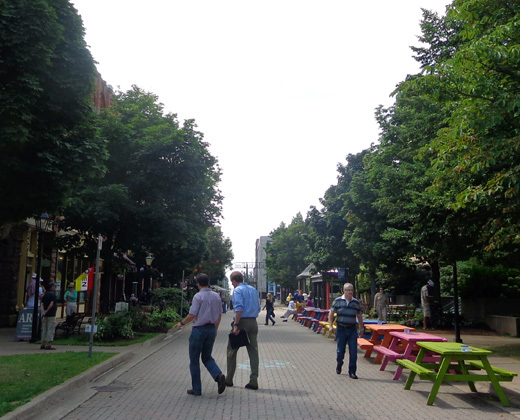 On those brightly-colored picnic tables shown above are painted board games like checkers and chess, designed to encourage folks to stop and relax. The playing pieces are in little plastic bags. I think what surprised me the most was that the playing pieces were still there. Where would that happen in the United States?? This cafe might have been a better choice for lunch than Steamers. 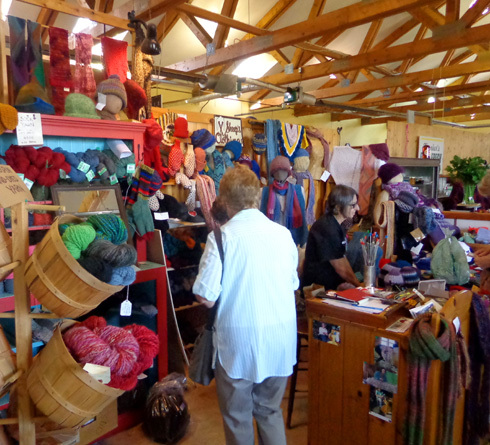 Every Wednesday and Saturday during the summer farmers and artists bring their goods to this popular farmers' market on the east side of town. 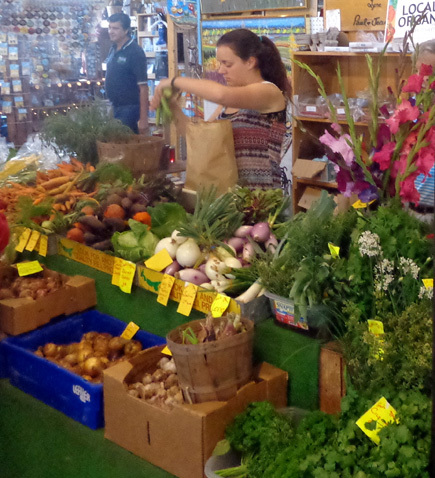 Although this market isn't nearly as large as the one in Halifax we still enjoyed the wide variety of fresh vegetables and fruits, seafood, meat and poultry, baked goods, wines, and ethnic cuisine. I regretted not getting some locally-produced wine on our first trip to the market so we returned in the afternoon after a day trip and I got a bottle. It was good! 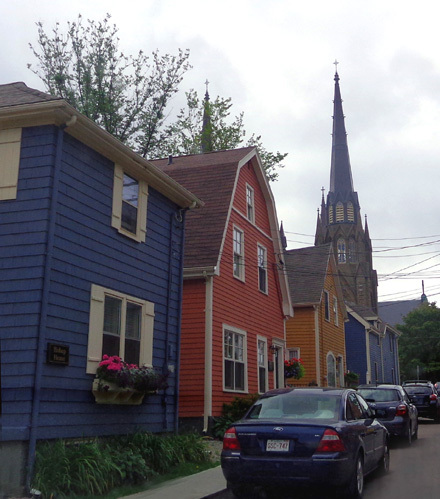 Most of the residents of PEI are descendents of the original settlers from Scotland, Ireland, England, and France, regions in Europe known for their farmers and skilled craftsmen and women. 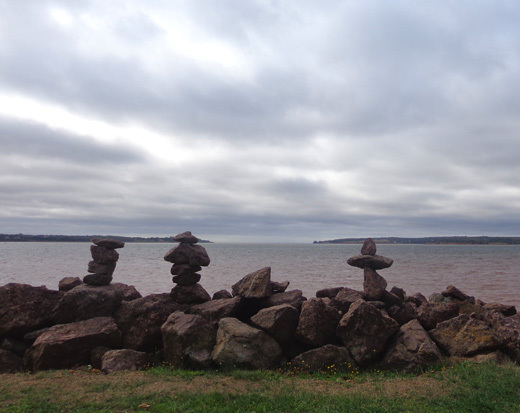 You can find all sorts of beautiful artwork and crafts everywhere around Prince Edward Island.